Credit: Jing lab, UC Riverside. RIVERSIDE, Calif. — A molecular geneticist at the University of California, Riverside, has secured a four-year grant aimed at halting the spread of a deadly bacterial disease that continues to spread among California’s citrus trees. 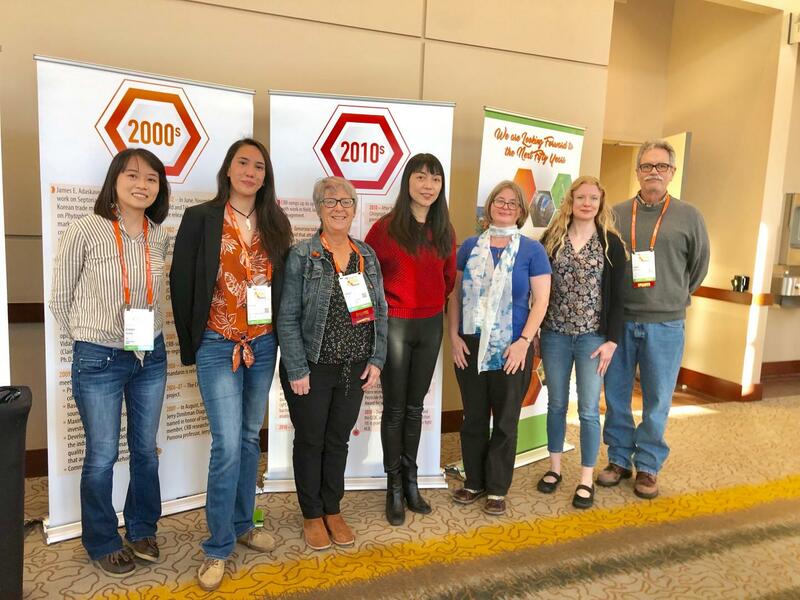 The award of nearly $4 million, which comes from the National Institute of Food and Agriculture of the U.S. Department of Agriculture, will help cure citrus trees affected by huanglongbing disease, or HLB, and protect healthy trees from infection. The research team led by Hailing Jin, the grant’s principal investigator, aims to achieve this goal by developing therapeutic and preventive solutions using a novel class of citrus-derived antimicrobial “peptides”– naturally occurring chains of amino acids found in all living organisms. HLB, which is also known as citrus greening disease and eventually kills citrus trees, has decimated Florida’s citrus groves; the threat to California’s multibillion-dollar citrus industry is grave. The Asian citrus psyllid, the insect that vectors the HLB bacteria from tree to tree, has been found also in Louisiana, Georgia, South Carolina, Texas, Cuba, Belize, and Mexico’s Yucatan peninsula. To date, the disease has been controlled by planting HLB-free citrus germplasm, swiftly eradicating infected citrus plants, and using systemic insecticides on the Asian citrus psyllid. The University of California’s Citrus Clonal Protection Program, located in Riverside, provides a mechanism for the safe introduction of pest- and disease-free citrus germplasm into California, where the best strategy so far to keep the disease at bay is the application of insecticide treatments to prevent the psyllid’s spread into citrus-growing regions. Jin explained that the peptides her lab has identified are cost-effective, stable at high temperatures, and easy to synthesize. They work better than antibiotics, she said, and are safe, being derived from close relatives of citrus, such as the long-consumed Australian finger lime. The peptides are effective also in killing zebra chip disease bacteria that can threaten the potato industry. Jin will be accompanied in the research by the following co-principal investigators: UCR’s Kerry Mauck, Georgios Vidalakis, Bruce Babcock, and Tracy Kahn; Kristine Elvin Godfrey of UC Davis; Gregory McCollum of USDA; and Svetlana Yuryevna Folimonova and Megan Melissa Dewdney of the University of Florida. The project also has a strong outreach component. Jin and her team will work closely with growers, teaching them how to treat HLB-affected trees and vaccinate young plants. The researchers will work closely with the California Citrus Research Board as well as with the EPA. UCR will receive about $2.5 million of the grant. The project will involve the participation of UCR undergraduate and graduate students. UCR’s Office of Technology Commercialization has filed a patent on the technology.